I love nothing more on weekend mornings/afternoons than waking up slow and having a nice home-cooked breakfast together. More often than not, this ends up being bacon, eggs (for Drew), and pancakes (mostly for me). 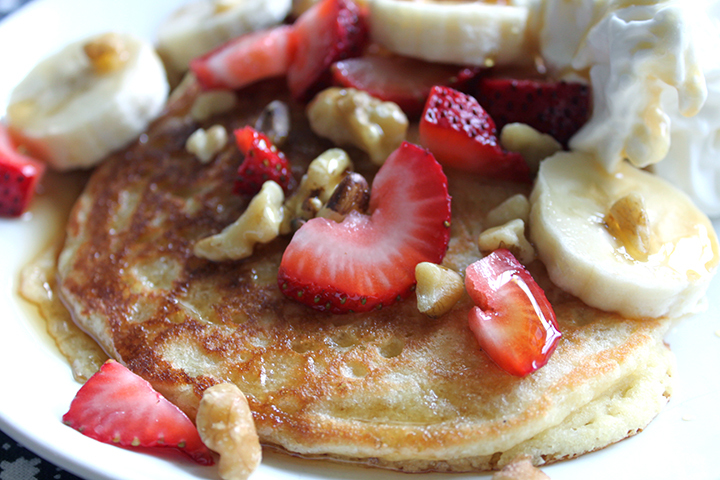 However, I expect a lot from my pancakes, I don’t want to simply be eating flour and sugar for breakfast. Since I’m gluten-intolerant and eat a mostly paleo diet, this means healthier pancakes are the only ones that stick in this household. I have several ones I like (see Paleo Pumpkin Pancakes and Maple Pecan Pancakes) but I’m particularly excited about these as they resemble a regular fluffy pancake more than the others (Drew approves!). I hope you enjoy! *Omit corn meal and sub with additional almond flour to make completely paleo. 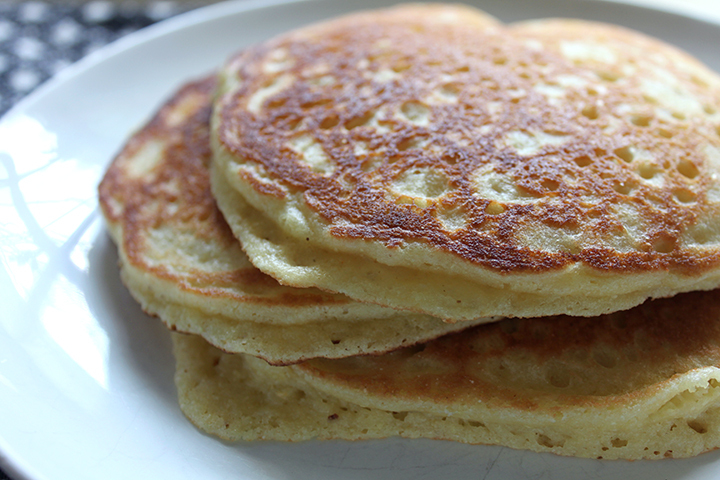 I add corn meal because I like the slight extra crunch/crisp it gives the pancakes and it reminds me of the cornmeal pancakes my grandmother used to make. 1. Mix together dry ingredients (almond flour, corn meal, arrowroot flour, baking soda, baking powder, salt). 2. In separate bowl, mix together wet ingredients (almond milk, lemon juice, maple syrup, vanilla, eggs, coconut oil). 3. Combine wet and dry ingredients and stir until smooth (batter will thicken as you mix together). 4. Heat griddle (I heat mine to ~350 degrees) and grease lightly with coconut oil. 6. Serve with fruit, nuts, etc and enjoy! P.S. I strongly recommend cooking these on an electric non-stick griddle. I use mine all the time for pancakes, arepas, tortillas, etc — it’s one of the hardest working appliances in our house and something I consider a necessity for successful pancake cooking/flipping!